If you love Starbucks but hate paying those high prices, we've got some secret hacks that will save you money every time you visit your favorite Starbucks. By taking advantage of reward programs and promotions, you can get some great discounts and even free Starbucks coffee and food items. I've also got all the details on how you can get your favorite drinks for less with a few ordering tips as well as the lowdown on how you can get discounted and free Starbucks gift cards. If you enjoy saving money at Starbucks, you'll also want to know how to get free Krispy Kreme donuts, free coffee on National Coffee Day free donuts on National Donut Day, and how to get free food at hundreds of restaurants just for joining their rewards programs. Illustration: Kelly Miller. © The Spruce, 2019. The quickest way to save money at Starbucks is by joining the Starbucks Rewards program. You can get free drinks and food, discounts, free refills, and even your personalized gold card. To get started you'll need to get a gift card and then register it with their website or through their mobile app. Use it when you pay to rack up those stars that you earn for purchases. You'll want to use the Starbucks app too, there are frequently discounts and freebie offers available. As part of the Starbucks Rewards program, you'll automatically earn a free birthday treat you can redeem with the Starbucks app. You'll get an email a few days before your birthday reminding you to redeem your birthday freebie. Have your barista scan your app and then redeem your reward. You'll need to be a member 30 days before your birthday. The best part of this birthday freebie is that you can get any size drink or any food item for free. The only items excluded are loaves, sets of bars, and Starbucks Evening menu items. Take a look at the Starbucks menu and you'll see three sizes available—Tall (12 oz. ), Grande (16 oz. ), and Venti (20 oz.). Starbucks has a secret cup size that will save you some cash. Order your drink as a Short and you'll get an 8 oz. serving for less money than a Tall. During certain promotions, Starbucks also sells drinks in a mini size, which is 10 oz. and will also give you a nice price cut. Bring in a reusable cup from home and you'll get a $.10 discount on your drink. You can use any reusable cup you want to get the discount, it does not have to be a Starbucks reusable cup. You can not use one of Starbucks "for here" cups to get the discount. Starbucks runs a variety of promotions through the year that will save you money. In the past, they've had events like treat receipts, happy hours, and holiday promotions that will get you discounted drinks. I find the easiest way to stay on top of the promotions is to follow Starbucks on Facebook. If you're a Target shopper, be sure to keep an eye on those coupons that spit out while you're checking out, you may get BOGO drink offer coupons for the Starbucks inside of Target. You can get a free refill on brewed coffee (hot, iced, or cold brew) as well as tea (hot, iced, or shaken) during your visit to your local Starbucks. To get the free refills you must pay with a Starbucks card or through their mobile app for your initial purchase. You'll need to show that payment method again to get your free refill. This deal isn't valid through the drive-thru and you'll need to stay in the store with your purchased drink before you can get your refill. The great news is that your purchased drink can be any beverage you want and you can still get a refill or brewed coffee or tea. Another way you can save money at Starbucks is by making your own iced latte. You'll need to order a triple espresso over ice in a Venti cup and then head over to the condiment bar and fill up the rest of the cup with the complimentary milk. A Venti Frappucino is 24 ounces, and ordering one is cheaper than getting two Tall Frappucinos at 12 ounces each. You'll need to order the Venti Frappucino and two tall cups. You'll need to split it yourself to get the savings. You can order a French press coffee at Starbucks and you'll get around 32 ounces of coffee you can split among you. Do the math, and you'll get your coffee for about half-price ordering this way instead of as individual cups. Often when you order a tall coffee, the barista will ask you if you want to leave room for milk or cream. While this is handy, it also means less coffee. You can avoid this by ordering your Tall coffee in a Grande cup. Then you'll get all the coffee you paid for but you'll have plenty of room for milk or cream. The iced tea that comes from the pitcher at Starbucks is double-strength and then watered down when they pour it for you. Request your iced tea with "no water" and you'll get the double-strength tea that you can then make into two drinks. If you love the Chai Tea Latte, then this Starbucks hack is just for you. Not only will you save some cash, you'll also cut out some sugar and calories. Starbucks sells pricey bottles of water but there's an easy way around this, ask for a cup of ice water from the barista. Starbucks water they use for coffee is triple-filtered and that's the same water you can get for free. The standard size is a Tall and you can get it with or without ice. It's common procedure at Starbucks to fill your cup full of ice and milk and then add the coffee. You can request "easy on the ice" or "light on the milk" and you'll get more coffee and less ice or milk. Your dogs can get a free treat at Starbucks too! Order a Puppuccino and you'll get a free espresso cup filled with whipped cream. This is just one of the items on Starbucks secret menu, but this is the only one you can get for free. 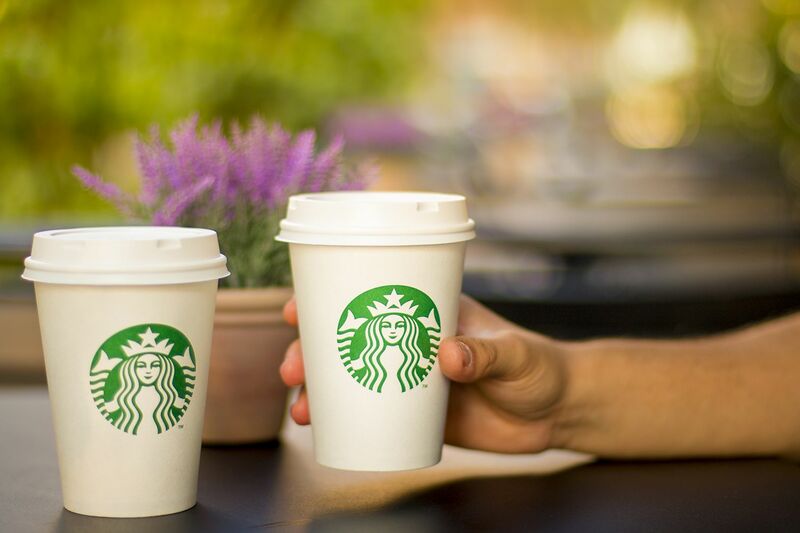 You can redeem your points with different points programs to earn free Starbucks gift cards. You'll need to take surveys, watch videos, and do some online shopping to rack up those points. Keep your eye out and you can occasionally find discount Starbucks gift cards. I've picked up several discounted Starbucks gift cards at Groupon throughout the year, costing just $5 for a $10 gift card. This deal isn't available all the time, but you'll want to take advantage of it when it is. Other places to look for discounted Starbucks gift cards are CardCash and Gift Card Granny.